You mighta heard that the Monkees have a new album coming out from Rhino 10/12 — Christmas Party. Cool, right? I’m excited for it; 2016’s Good Times was superb. I gotta tell you, this gig couldn’t have happened to a nicer, more deserving guy. 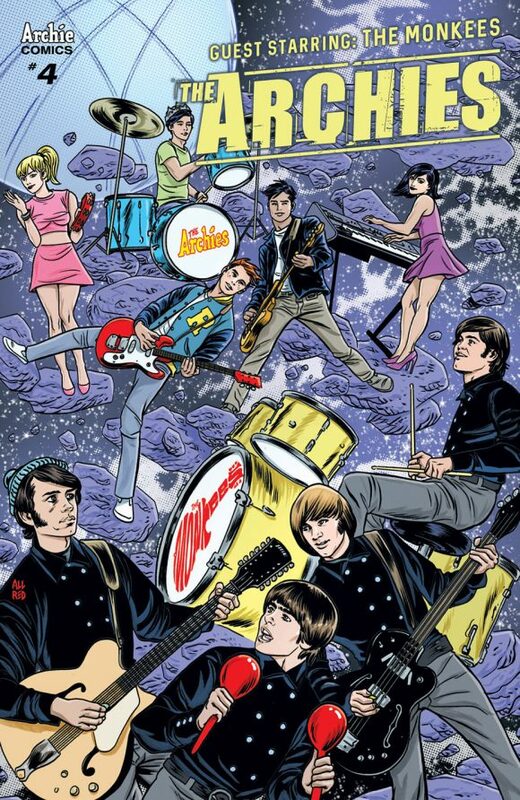 Mike’s love for the Monkees is intense: He even put together for us a list of his 13 FAVORITE MONKEES SONGS (click here) when he got the variant-cover gig for last January’s The Archies #4. Dan Greenfield: How did this gig come about? Mike Allred: I can’t remember exactly. It all started a couple years ago, a “chicken and the egg” thing in that I can’t remember what came first. I was deep into doing all the Batman ’66 covers and there were the complete full issues I did. And there were all the crossovers with Steed and Mrs. Peel, Wonder Woman ’77, U.N.C.L.E., and it seemed to me that a Monkees/Monkeemen crossover was a natural. I had an idea for it, and someone from Rhino Records had mapped out a story too and approached me. It might be important to point out that the Batman TV show and The Monkees TV show were part of my childhood daily diet for years. They ran in reruns on Saturdays and weekdays after school, along with Star Trek, Twilight Zone, The Saint, and other pop culture gems. Anyhoo, there were various conversations, and back and forths, and somewhere in there I was asked if I’d be interested in doing the album cover. “Uh, YEAH!” I can’t even remember doing it now. I was on a crazy high trying to squeeze everything I could into it. The Archies #4 variant cover by Mike Allred. Colors by Laura Allred. Dan: Have you met the band? Mike: We actually met Micky Dolenz and his wonderful wife in NYC at the same show where we first met Adam West. How weird is that? And soon after we were crazy pumped to meet Davy Jones at a future show, but then he passed away. So, I think this would have been late 2011 or early 2012. I remember dressing warm since it was so cold. We’d love to meet Mike and Peter. And take every opportunity for that and seeing Micky again. It is said you should never meet your heroes. I’d have to disagree. So far, so good. Purely joyful inspiring experiences. Dan: What kind of feedback did you get from them on your album cover? Mike: Just that everyone dug it. Dan: How much of the album have you already heard? What can we look forward to? Mike: I’ve heard ALL of it! It is insanely good. Christmas classics mixed with instantly catchy earworm gems! I can honestly say it’s my very favorite Christmas album! Dan: When did you first meet the Monkees, as it were? They just always were. I can’t remember a time in my life when the Monkees didn’t exist. Then rock record albums came into our house when our older cousin Robin came to live with us. She had the best of everything, including Monkees albums and 45s. Bliss! Dan: Do you have any groovy Monkees memorabilia? Mike: Everything on the album cover for starters. We have a vintage Monkees notebook that is packed with bubble gum cards. A Head movie poster signed by Micky, and a Monkees drum head, and a bunch of stuff Micky gave us, including this super groovy photo album of the Monkees’ 1967 tour when Jimi Hendrix opened for them! The box sets, of course, and a giant stack of books on them. Dan: Where does this gig rank in your career? Mike: I’d have to say it’s tied for first with two other projects I can’t talk about yet. In so many ways, this ties a bow on my childhood memories, but also locks in the fact that The Monkees were never a passing phase for me, but a constant. My love for their music only increasing with enthusiasm and appreciation. I’m compelled to share with you that I believe I had a very happy childhood. But that was turned upside down with less than happy events I’d rather not go into. But then I met Laura, and everything dark in my life started to get pushed back by her light. I’ve learned to embrace optimism wherever I can find it. And then, crazily, the past few years have exploded with rewards I never could have contemplated. This experience is one of them. Dan: You’ve already provided us a list of your TOP 13 MONKEES SONGS. Which are your favorite albums — and why? Mike: Robin had their debut album, so it was easily the one I played the most then because it had the theme song, which always lit the show up in my head. For many reasons, it would be my favorite. But I also agree with the purists about Headquarters. An album the band fought so hard for and scored. A little detour here: I’ve never seen a more unfair backlash against a band — about their not being a real band, being manufactured for TV, blah blah blah. I don’t care how a band comes together, I’m just bananas for the result, and their chemistry is magic! And their talent undeniable. A certain entity will only ever be known as the “Rock & Roll Hall of Shame” until they pull their heads out about snubbing legendary artists for arbitrary reasons. I dig ALL their albums, but as of today I might put Good Times and the Christmas Party right at the top, for their impossible power. When listening to both, it was like my mind went on some crazy trip making space and time completely insignificant. And then Changes, with only Micky and Davy on it, suddenly took a big leap for me. An album I’d largely, politely held at arm’s length suddenly wrapped itself around me. I’m crushed for time, actually cranking on the music video for Christmas Party’s first single, or I’d probably write a book on what I love most about each album. So, I’ll leave it there. 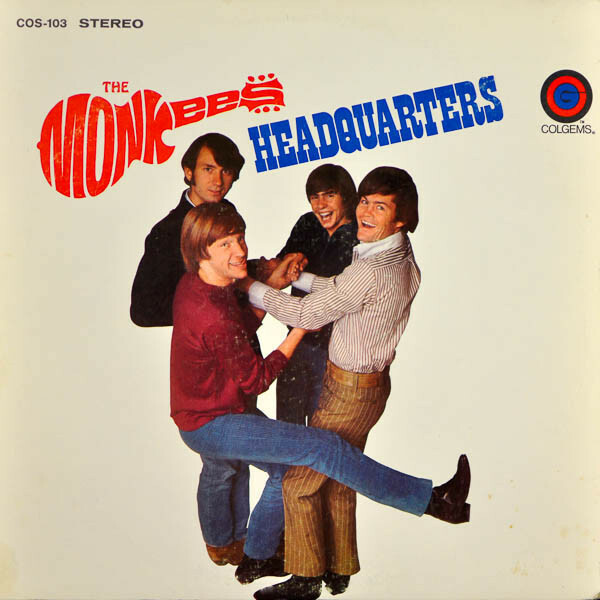 Dan: As you just pointed out, the Monkees were lambasted on their arrival for not being a “real band.” It’s a label that still sticks in some quarters, unfortunately. But their music has endured for more than 50 years. Why do you think they still resonate into the 21st century? Mike: Because they were much much more than a “real band.” Mike, Micky, Davy and Peter just clicked! Their phenomenally unique voices instantly recognizable and moving, their own songwriting superb, solid musicianship, unbeatable charisma, and the talent behind the band was pure gold: Neil Diamond, Harry Nilsson, Carole King, Boyce and Hart, on and on. Musicians loved them. David (originally David Jones) Bowie dug ’em! Great pals with the Beatles, Alice Cooper, Harry Nilsson… only snobby heartless, ill-informed critics seem to take swats at them. Their childlike and goofy TV antics grab the kiddies and the music grows with them generation after generation. And they have one of the coolest logos ever created. Who has a cooler logo than The Monkees? 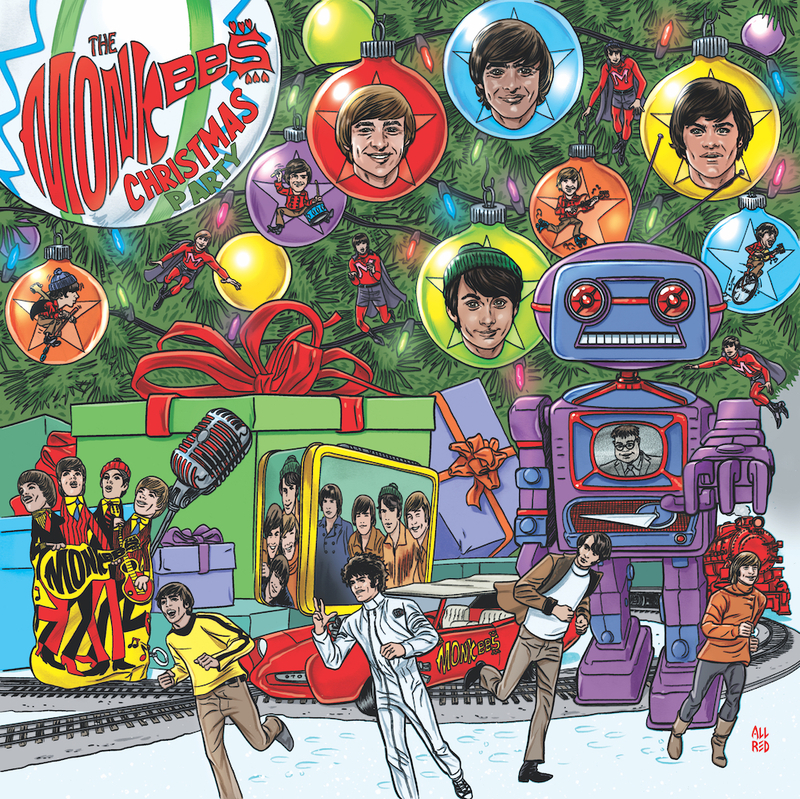 — MIKE ALLRED Picks 13 MONKEES Songs. Click here. 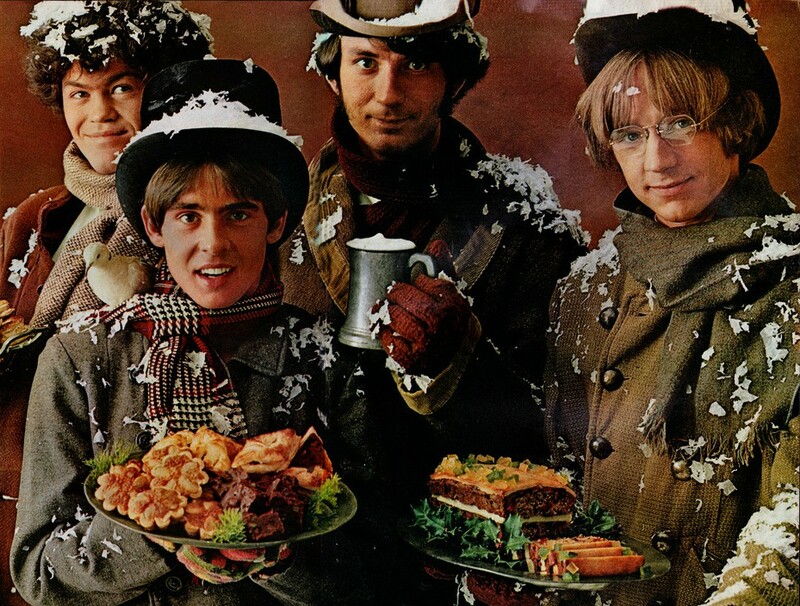 — A GROOVY Look Back at THE MONKEES. Click here. Wow, fantastic stuff! Love the Monkees, and recently turned my daughter on to them too. Looking forward to the album and that video! Thank you for thisinterview. Love Allred’s work. FYI to your readers, Target will be selling an exclusive edition CD with two bonus tracks. 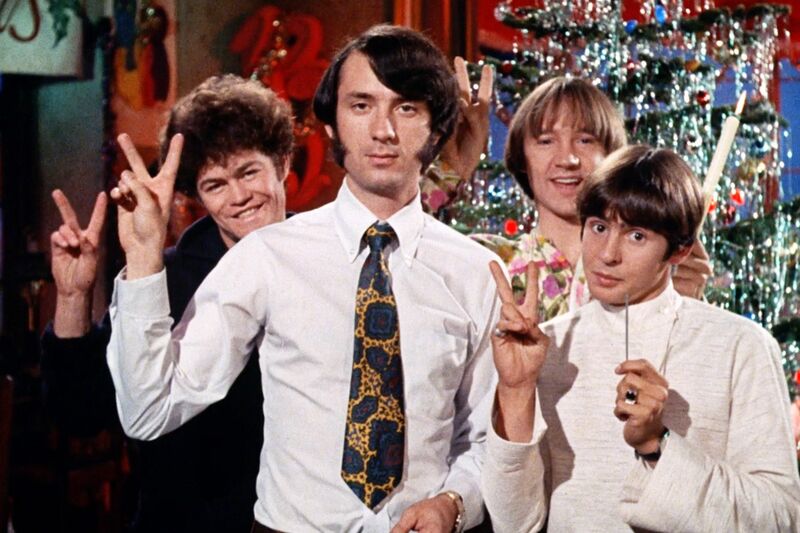 Fifty years later and we’re getting new Monkees music…..groovy! Great site Dan.